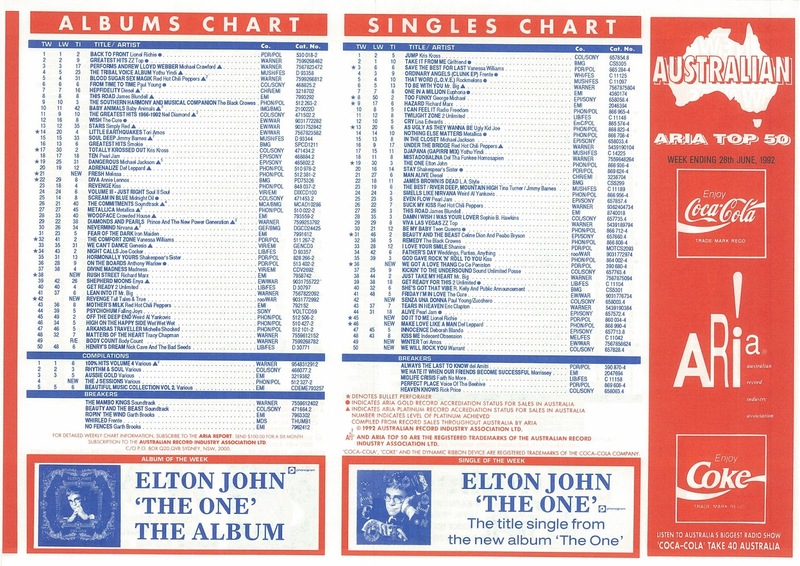 I've always considered any song that makes the top 50 a hit - even if it's just for one week. That's why I don't count acts like A Flock Of Seagulls, Deee-Lite and Wheatus as one-hit wonders, since they all had another song that made it onto the printed ARIA chart, albeit fleetingly. This week in 1992, four of the six new entries were songs that only stayed in the top 50 for a single week - one-week wonders, if you will. All four acts had other, much more successful hits, and in one case, this week's newcomer is the song that prevents them being a one-hit wonder. An act that is often mistakenly referred to as a one-hit wonder climbed to number 1 this week in 1992. "Jump" by Kris Kross started a three-week run on top - and we'll see their other top 50 single, which reached number 21, in about a month's time. BNC is one of those names I've always been aware of, but I've never heard any of her songs until now - including this piano ballad from her self-titled second album. Spoiler alert: there's a key change. Her second solo album having not done as well as the first, Kate Ceberano tried a few new things in 1992, including popping up on this track by the former The Sports member. Featuring "Rhinoceros" from 1991's debut album Gish, this EP was the first ARIA chart appearance by the band who'd land their breakthrough hit in a couple of years' time. In a couple of years, The Poor Boys would be known just as The Poor and reach the top 10. For the time being, this EP featuring "What I'd Do To Get A Piece Of You" got things started. The song that came closest to matching the top 50 achievement of his debut solo single, "Suedehead". "We Hate It When Our Friends Become Successful" was the lead release from Morrissey's third album, Your Arsenal, which remains his highest-charting album in Australia, peaking at number 12. With odd exceptions, I've never been a massive fan of The Smiths or their former frontman, but I don't mind this track at all. Talk about an unnecessary cover version. This update of the Queen anthem was recorded by Warrant - who I thought were trying to steer clear of cheesy hair metal after "Cherry Pie" - for the soundtrack to Gladiator. No, not the Russell Crowe film, but a 1992 boxing movie starring James Marshall (he played James in Twin Peaks) and Cuba Gooding Jr, who'd shot to fame in the previous year's Boyz N The Hood. "We Will Rock You" exited the top 50 again the following week. 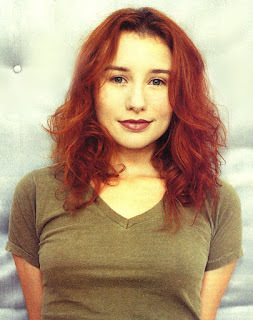 Our next one-week wonder was the debut hit (it also made the top 30 in the UK) for American piano-playing singer/songwriter Tori Amos. On the exquisite "Winter", Tori talks about her relationship with her father - a minister, who she says created a very disciplined and religious home, and, as a result, gave her plenty of material to write about. As good as "Winter" is, I'm sure quite a few people bought the single for the cover version included as a bonus track: Tori's version of "Smells Like Teen Spirit". The biggest new hit of the week - in terms of chart longevity - was this follow-up to "Let's Get Rocked". Taken from recent chart-topper Adrenalize, "Make Love Like A Man" spent eight weeks on the top 50, which was about seven more than it deserved. I'm quite partial to a bit of Def Leppard - I've even seen them live - but this track is the definition of big, dumb rock. Six years is a long time in music and while we might have once found Lionel Richie at or near the top of the singles chart, this brand new song spent just one week on the top 50 here at number 45. Of course, Lionel was the proud owner of the week's highest-selling album - his greatest hits collection Back To Front, which spent six weeks at number 1 - but I'd like to think the far superior "My Destiny" (a UK top 10 hit) would've been a better choice for a single than this snoozefest. Speaking of snoozefests released to support greatest hits albums, this bilingual collaboration between '80s star Paul Young and Italian musician Zucchero Fornaciari was a revamped version of a song originally released by the latter in 1987. The new take on the ballad had actually been released in 1991 to promote Paul's best of set From Time To Time - The Singles Collection, but the single had missed the top 100 and the album had only reached number 93 in October. 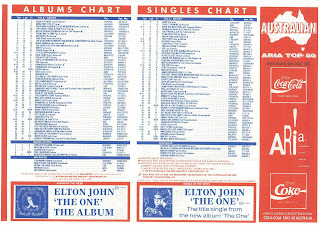 When the album suddenly became successful in 1992, the single was given a second chance and, for three weeks, put Paul back in the top 50 for the first time since 1985. Its entry position suggested it'd spend at least one more week inside the top 50, but this follow-up to "Finally" fell out just as quickly in seven days' time. This week's effort was actually quite an anomaly - "We Got A Love Thang" had spent five weeks on the top 100 from mid-May getting no higher than number 68, before dropping out entirely. This re-entry at number 36 was followed by it plummeting to number 72 the following week. Whatever prompted the sudden surge in brief interest in the song - I'm guessing a price drop or promotion? - was unsustainable. It's a shame, because the track was another slickly produced (and remixed, courtesy of Steve "Silk" Hurley) slice of house-influenced pop from the American singer, who never saw the inside of the ARIA top 50 again. Next week: nine new entries on the top 50 - and a few of them even stuck around for quite a while, including three cover versions of songs that'd been first been hits in the '70s and the return of Australia's most internationally successful band. Like you, I remember seeing Beth Neilson Chapman's name (without checking, I'm pretty sure this one reached the Vic/Tas top 50 state chart printed on the reverse side in my state), but not hearing any of her music... until now. I didn't picture her looking like that. I remember Tori being hyped in the free Brashs magazines (remember those? ), and after reading some of a feature article on her in it, assumed she was just an annoying American, talking about God, expecting I'd hate her music. Then I heard 'Winter' in the rage top 60, and it grew on me... but not before falling out of the top 60, so I couldn't tape the video. I remember humming the tune once when walking my dog. But then I quickly forgot about her, until 'Cornflake Girl', and soon after bought 'Little Earthquakes' and became an obsessed fan for a few years, collecting her many b-sides and other things, though oddly I didn't actually hear her version of 'Smells Like Teen Spirit' until seeing her live in '94. 'Winter' was probably my favourite song of hers. I over-listened to it, though, so it has lost some of its impact for me. Paul Young actually came out here for a promo tour around/just before the belated 'Senza Una Donna' chart entry. I think I saw him perform it (or something else) on Hey Hey It's Saturday... though, surely Zucchero wasn't with him, so I'm not sure how he pulled it off. Maybe singing the whole song actually live? I remember being susprised by 'We Got a Love Thang'’s belated top 50 entry, and for a solitary week. Maybe she also did a promo visit? Aside from discounting, I think something was definitely up with the charts around mid '92, with the 9 entries next week being another sign. Correct me if I'm wrong, but I'm fairly sure "Too Funky" by George Michael moving up 42 places from no.50 to no.8 this week is the highest chart jump for the entire decade of the 1990s? Silverchair's 'Pure Massacre' climbed from 92 to 2. I assume it debuted at that lowly number due to having maybe a day's sales in a smaller state, or where a handful of stores broke an embargo. Oh really, I didn't know that! I thought there might have been things like that happening in the 100-to-51 region.